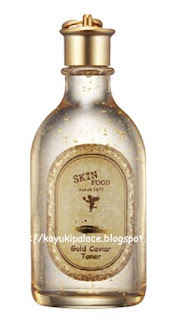 According to the descriptions, the caviar series include Premium Russian Caviar and 24 K gold (softens your skin). Together they can recover, moisturize, firm and supply nutrients to the bottom layer of your skin. Caviar contains Omega-3 which helps to recover damaged skin cells, cleans up impurities within cells, reduces fine lines, hydrates, anti-ages, and softens your skin. It increases the level of absorption for other skincare that follows. Gold contains negative ions which aids blood circulation and cells regrowth. I received a few sample sets for this toner and emulsion, so I didn't buy the full size. One sample set lasted me ~2 weeks. Skinfood is quite generous making big size samples. Many of the Skinfood products have a strong scent. The texture is just like a clear light gel, most Korean toners are thicker than other watery toners. It doesn't feel oily, feels super hydrating and refreshing and absorbs fast!! Same feeling I had for the Innisfree Olive Real Skin and Skinfood Black Raspberry Toner. The 24K gold as one of the ingredients make me feel elegant!! 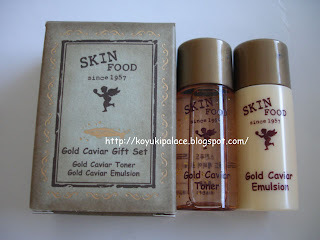 I've never used a "golden" skincare product ever in my life~ HAHA! !